Name: Needed: Your Input on Tourism! Pierce County Economic Development (PCEDC) is working with the University of Wisconsin-La Crosse Tourism Research Institute to complete a research project with the goal of attracting greater tourism exposure in Pierce County. All area residents are invited to attend this community meeting to ffer input on tourism in our area. Over the past two years, Pierce County has shown increases in consumer tourism spending. Last year's Cheese Curd Festival generated a $2.55 million impact for our area. Yet, Pierce County ranks among the lowest in tourism consumer spending in the state. That means there's nowhere to go but UP and we have some great potential in this area! Moving the needle in even a small way in this area will mean millions of dollars funneled into our local economy! 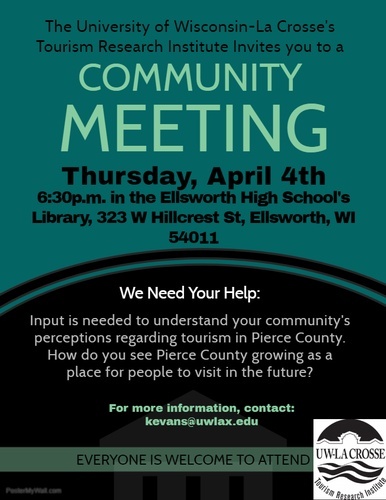 Plan to join us on Thursday, April 4 for this important input session!